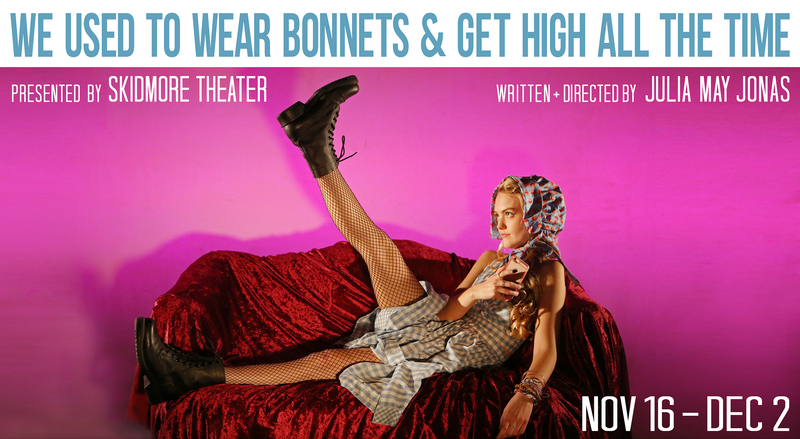 Skidmore Theater is pleased to announce our Fall Main Stage production, the world premiere of We Used To Wear Bonnets & Get High All The Time, an all-female response play to Eugene O’Neill’s classic Long Day’s Journey Into Night, written and directed by celebrated Brooklyn – based playwright and director, Julia May Jonas. An 1890’s factory becomes a 1940’s photography studio becomes a 1990’s live/work space becomes a present-day cultural landmark. We Used To Wear Bonnets & Get High All the Time is a multi-disciplinary theatrical exploration of inherited trauma, addiction and inter-generational forces beyond our control, as well as an inquiry into how families can be institutions. Through organic innovation, score-like composition of text and movement, humor, raunchiness, high theatricality, and original music by Brian Cavanagh-Strong, We Used To Wear Bonnets & Get High All The Time looks into why we’ve become who we’ve become, and to what extent we have agency in changing our fate. “In summer of 2015 I set for myself the challenge of responding to five classic American plays with five original full-length plays for mostly female situations and society. It started as an exercise, an exploration in structure and storytelling. It was dark and personal, a dubious idea that me laugh. Of the five plays, Long Day’s Journey into Night was (and is!) the one that scares me the most. I have always loved it – the way O’Neill paints family resentments and the inability to free oneself of those resentments with such acute psychological realism. Since that summer of 2015, the project ALL LONG TRUE AMERICAN STORIES, a play-cycle inspired by All My Sons (Arthur Miller), Long Days Journey Into Night (Eugene O’Neill), True West (Sam Shepard), American Buffalo (David Mamet) and Zoo Story (Edward Albee) grows mammoth and mammoth-er. In addition to the Skidmore Theater production of We Used To Wear Bonnets & Get High All the Time (inspired by Long Days Journey Into Night), the full play-cycle is in development with residencies and showings at places including The Bushwick Starr, Dixon Place, New Georges, Local 61, The Tank, arsnova playgroup, the Great Plains Theatre Conference, NACL, and more.